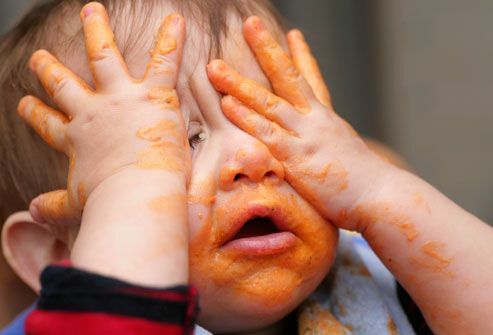 the food.ie: Baby led weaning - what is it and why? When the littlefoodie was born I had read a lot about the 9 short months of pregnancy and labour but very little about what to do when the baby arrives. This, although crazy, seemed to be very common among the other new moms that I met. Everyone reads what they need to know now and not much further. I definitely wasnt thinking as far ahead as introducing solids, so I was very confused when someone mentioned adding baby rice to milk at about the 8 week mark. Around this time one of the girls I know mentioned Baby Led weaning and it sounded like it made a lot more sense to me than baby rices and purees. So what is Baby Led Weaning (BLW)? In contrast to normal weaning where you introduce food slowly by feeding your baby purees of increasing thickness, with baby led weaning you jump straight to finger foods and focus on the baby feeding themselves. Its great for appetite control, nutrition and avoiding food pickiness later in life as you are introducing all textures straight away. Babies still get most of their nutrients from milk in the first year and choose to eat the nutrients they need when offered. Avoid sugar and salt - you dont want baby getting a taste for these! Embrace the mess. Apparently its messier but for a shorter amount of time as babies get used to feeding themselves. Im really excited about BLW because of my own love of food. I want the littlefoodie to be able to join in at mealtimes and experience all the joys and textures of food as they should be served and I dont want him to feel left out from what others around him are eating (this will mean less cake in our household!). I know there will be plenty of mess to deal with in the short term, but look forward to the benefits and will document the new foods and recipes I find as we start over the next few weeks.